What's In Your Recycle Cart, ABQ? 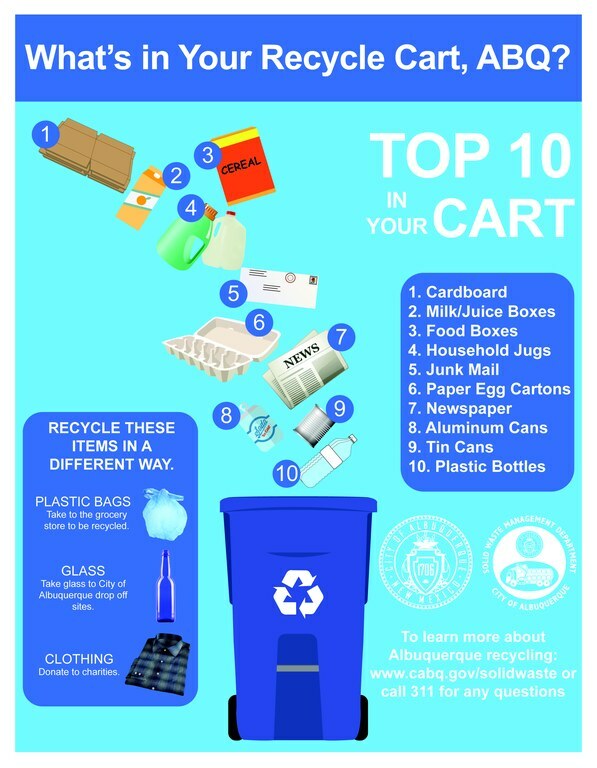 A Top 10 List of Materials that Should Be Placed in Albuquerque Residents Recycle Carts. One of the main questions asked by Albuquerque residents regarding recycling is: What can I recycle? Thanks to the City’s single-stream recycling program, recycling in Albuquerque is fairly easy. To make things even more convenient, we’ve put together a top 10 list of what materials should definitely go into your blue cart. There are several items that can be recycled in a different way. Plastic bags can be taken to your local grocery store to be recycled. You can take your glass bottles to the City of Albuquerque approved drop off sites. Clothing can be donated to local charities. Next time you pull your blue recycle cart to the curb, make sure you think of the top ten materials that should always be placed in your cart. Consider downloading the free Recycle Coach app and have instant access to your recycling collection schedules, collection guidelines, reminders, and more.